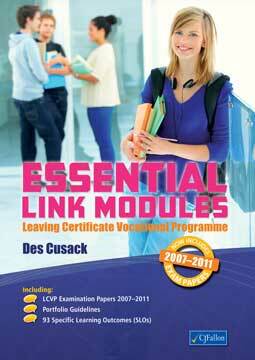 Essential Link Modules (2009-2013) for the LCVP comprehensively covers all 93 Specific Learning Outcomes (SLOs) on the syllabus. Includes five full examination papers from 2007 to 2011. Each of the 8 chapters has a wide selection of exercises and activities, encouraging student-centred learning throughout. Includes a ‘My Portfolio’ section where students can record a draft of each portfolio item, while following the guidelines provided. Strives to help the students to achieve the aims of the LCVP by providing the information needed to ‘take responsibility for their own learning’.